"That is not part of the commission’s charge, per se," the education secretary said. 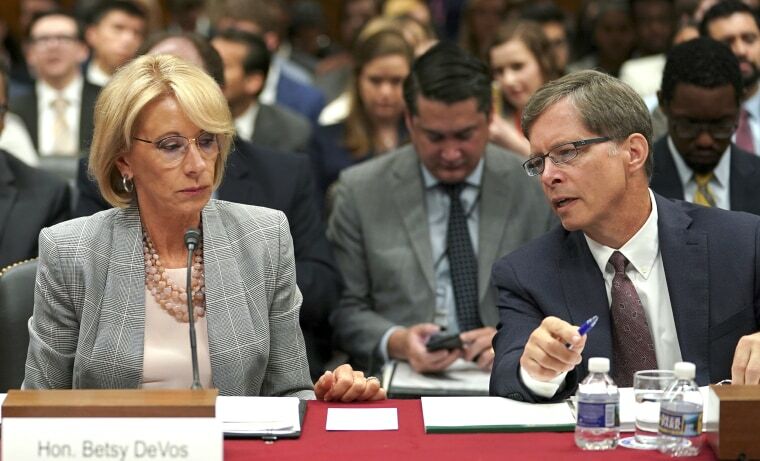 U.S. Education Secretary Betsy DeVos on Tuesday appeared to back away from studying guns' impact on school violence, telling a Senate panel that the topic was not a priority of the Federal Commission on School Safety. Her statement seemed to contradict the mission statement of the commission, which President Donald Trump formed after 17 students and teachers were shot dead Feb. 14 at a high school in Parkland, Florida. The Department of Education's website says the commission — led by DeVos — was charged with coming up with a range of recommendations to improve school safety, including a "discussion on minimum age for firearms purchases." DeVos made her remarks during testimony before a Senate subcommittee, where Sen. Patrick Leahy, D-Vt., asked if the commission would "look at the role of firearms as it relates to gun violence in our schools." She answered, "That is not part of the commission's charge, per se." Leahy shot back, "So, you're studying gun violence but not considering the role of guns." Schools are spending billions on high-tech security. But are students any safer? Leahy then asked a question at the heart of the commission's stated mission: whether an 18-year-old high school student should be able to walk into a store and "moments later come out with an AR-15-style gun and hundreds of rounds in ammunition." DeVos didn't offer her opinion. Instead, she told Leahy that the topic was "very much a matter for debate." The commission, which includes Attorney General Jeff Sessions, Health and Human Services Secretary Alex Azar and Homeland Security Secretary Kirstjen Nielsen, has met once formally since it was formed in March. It is expected to deliver a set of proposals by the end of the year. Later in DeVos' Tuesday testimony, which was supposed to focus on the Education Department's fiscal year 2019 budget, Sen. Jeanne Shaheen, D-N.H., asked if the commission was examining how other countries protect students from school shootings, including gun laws and treatment of the mentally ill.
Devos didn't say. But she said the commission is focused on where a "culture of violence comes from." DeVos also said the commission is reviewing school discipline policies to find ways to identify students who may pose a danger to their schools.